So, who do we want to see at Film & Comic Con Exeter 2019? As always, Doctor Who, Red Dwarf and Horror guests and I'll be happy. STAR WARS cast, The Hoff would be a dream.....Are Star Trek cast members beyond the realm? Star Gate...SG1 or Atlantis. 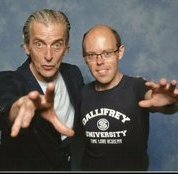 how about some actors from the current series of dr who, doesn't have to be anyone from series 11 precisely, it can b anyone from the 2005 series through to whats airing now...? John Levene would be awesome.